This plugin provides a simple configuration form in the WordPress dashboard to enable extra user profile fields. These fields can be setup in two realms, (1) one of which the account owner can see and modify, and (2) the second only the administrator can modify. With this version of the plugin, the extra user fields are searchable and are displayed in the users listings page. As well, this version comes with a convenient import and export tool to import/export your user meta information into workbooks and spreadsheets and to reload user meta information from a workbook in bulk. 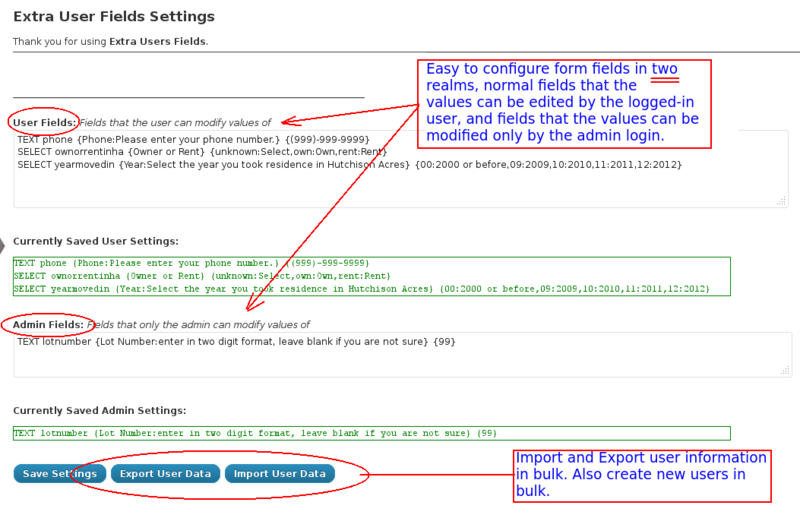 And the import feature can be used to create new user accounts in bulk. 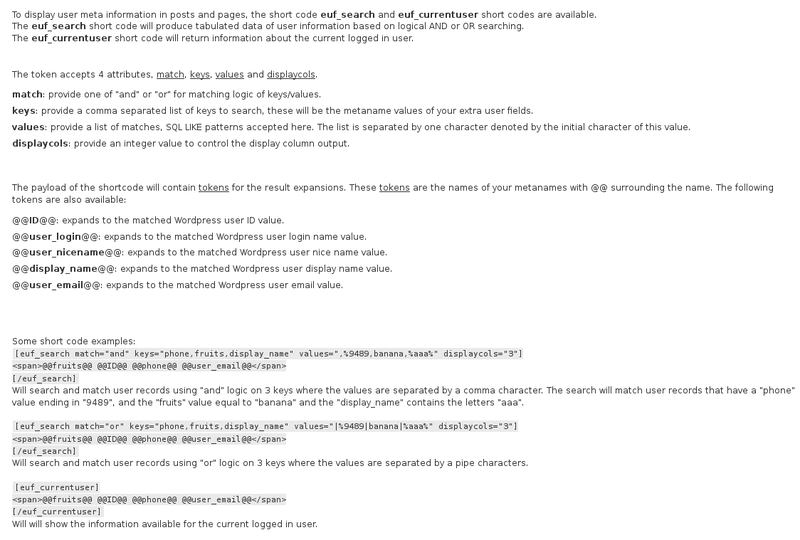 Use shortcodes to display user meta information in posts and pages. Please see the full list of features and screenshots below. Easy to configure form fields of types TEXT, CHECKBOX, RADIO, SELECT and TEXTAREA with singular and multiple value options. Datepicker integration as a mask on input fields. Input mask for text input control like telephone numbers and credit cards. Predefined form values for US States and Countries. Extended search features on the "All Users" page using the user meta fields you defined. Inclusion of Custom User fields on the "All Users" page. Import and Export feature to manage existing users in bulk, and to create users in bulk using tab-separated file. Shortcode support to display user meta information in posts and pages. Extended field definitions to temporarily enable/disable saved fields. CSS ready for 100% customization. Full system logging via syslog. Use the Donate button below to process your donation. Once you have completed the payment process of the Plugin through PayPal, you will be directed back to this website to download the WordPress plugin ZIP file. Your donation of $55.00 USD will provide you with a installable ZIP file for WordPress. The installation of ZIP at your WordPress site is the same as any WordPress plugin and can be installed on any WordPress site you manage. There are no restrictions or limits otherwise. Thanks! I appreciate your support of my work. 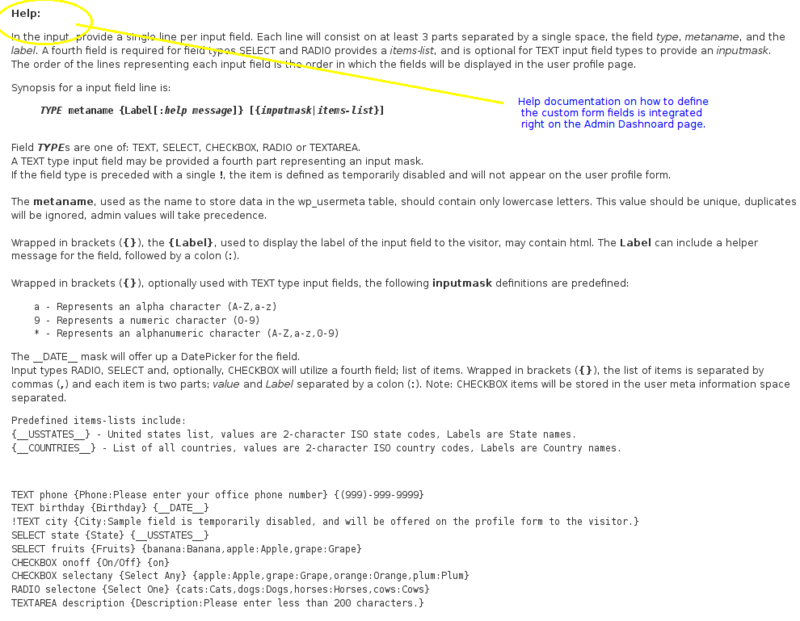 Setting up your custom fields in one of two realms, user-modifiable or admin-only-modifiable. 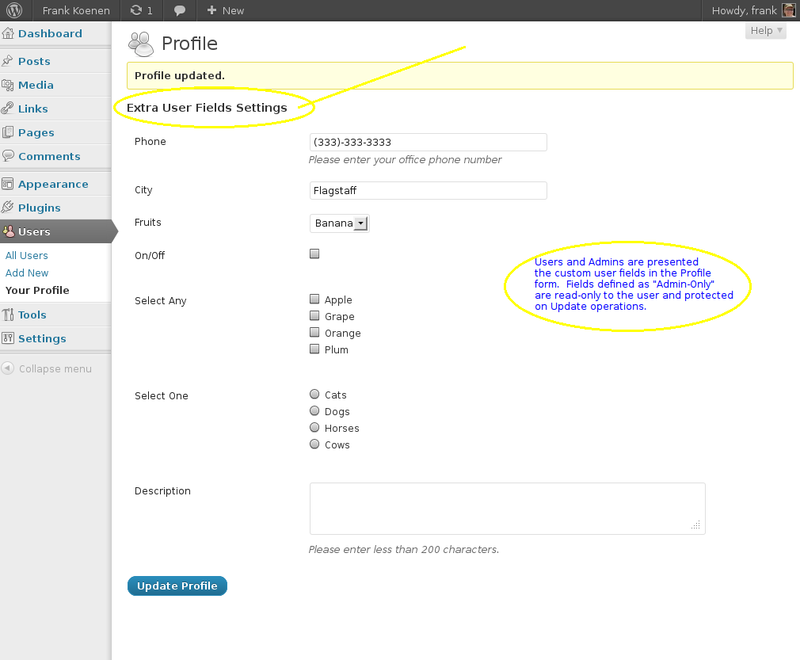 Sample showing the extra user fields in the user profile screen. Sample showing the extra user fields values in the user search screen. The plugin comes complete with detailed instructions and support. From the Wordpress Dashboard, the extra user fields data as well as the standard user meta data can be exported to a TAB or CSV formatted file. 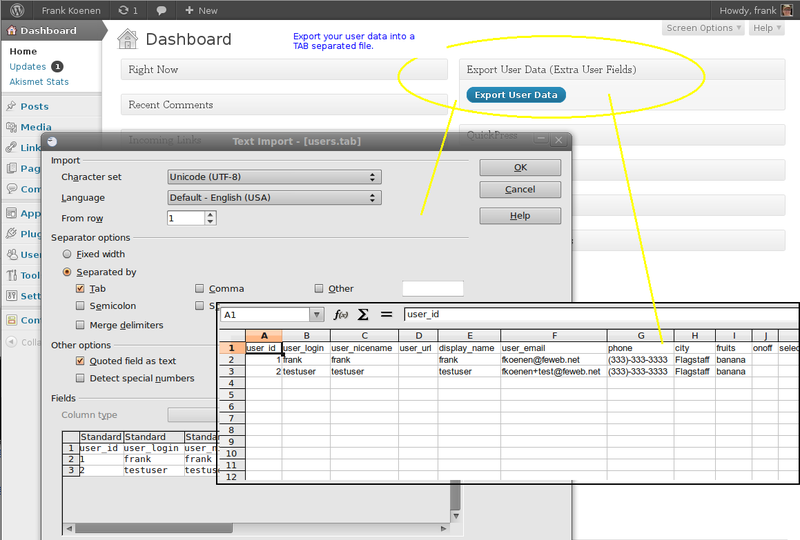 Import user data is also supported with new user creation in bulk. The short code support is quite extensive as well, providing robust logical search and display ability in pages and posts. The short code [euf_search] will perform logical AND or OR searching to produce tabular data for page and post display purposes. And the [euf_currentuser] short code will return information on the current logged in user.